I’m a girl who grew up in a nondigital world. When we needed to know something we went to the library; we researched information using books. Facts were readily at our disposal without any need for power or hand-held devices. The children in my class have Chromebooks. They can access Google and YouTube and PebbleGo anytime they want. It is helpful in many ways. But, nothing can compare with holding a book of facts in your hands. Normally, I am all about reading fiction. When we put together our “Best of 2017” lists, as book bloggers like to do, I had read 3 nonfiction books. Three. 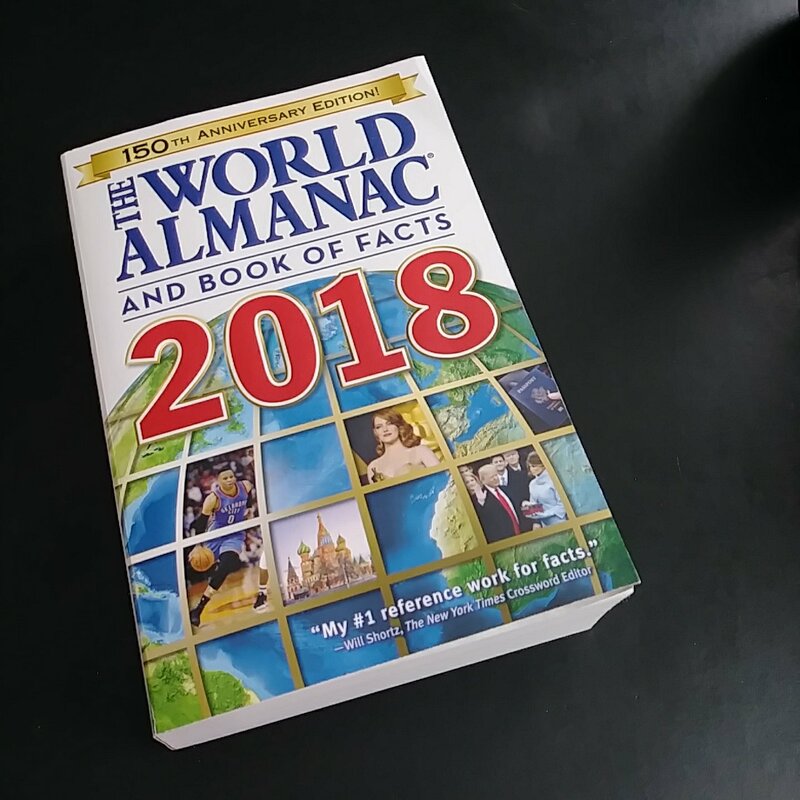 Yet, when The World Almanac and Book of Facts arrived at our door, I could not put it down. I flipped through it even as I walked to my husband asking, “Did you know…?” You cannot believe the amount of interesting and pertinent facts within its cover! Well, I could go on and on and on, but I tell you this is a fabulous resource to have to check on facts, to remember the year(s) gone by, and to consider the future. I can’t recommend it highly enough. 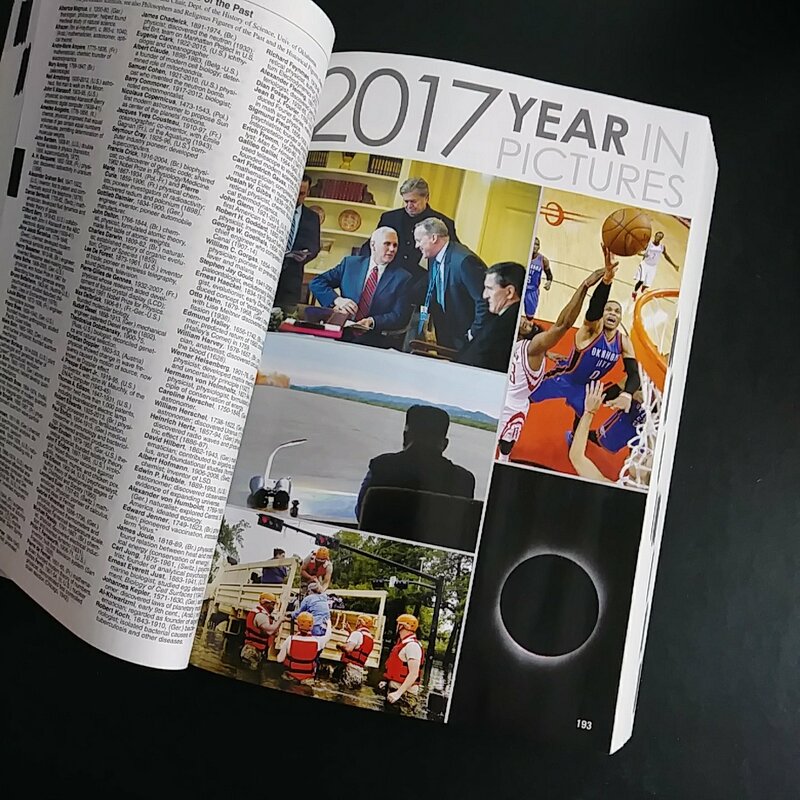 There’s even a section with the year in pictures. It always surprised me how many of these we sold every year at B&N, but I agree. What a plethora of information! P.S. I think I only read nine nonfiction books this year. It is amazing! I can’t sit and read this cover to cover, of course, but to sit with it and thumb through it for awhile is so interesting. Also, I’m so looking forward to sharing it with my class. They are data consumers in the first degree! I definitely want to increase my nonfiction books read which is why I have two going on right now. But, I do remember going to the library and looking through encyclopedias for information. Loved that. Do they even have encyclopedias anymore?! I don’t think our school library has encyclopedias. I’m wondering if the LMC director is even buying many nonfiction books at all anymore. When the children did their research on Native Americans this November, they found all their facts on line. I am seriously concerned about the use of technology in the classroom today; it certainly has a place, but it certainly cannot replace the teacher (whose job I feel it is encroaching upon). Of course I recognize that encyclopedias and almanacs grow obsolete, but this one is certainly up to date, and wonderful. My, this does bring back the memories! This used to be part of the core Reference collection of any good libary. Now it’s mostly for browsing purposes. One thing it does have that the internet does not, is a higher degree of accuracy and accountablity. Theres a world of difference between what actually happened and what someone needs to have happened. Too much of the latter can be found online these days. And yes, hard copies of the more important encyclopedias do still exist. They went away for a while, then the publishers found out (the hard way) that there is still a market for a set of encyclopedias in book form. I love how you said there’s a higher degree of accuracy, which I totally feel is true, as this book is more based on fact than feeling (as you so beautifully put). It would be very interesting to me as well. I’m not sure how many non-fiction books I read in 2017 (probably only a handful). Happy New Year, Bellezza! I read only one novel last year: The Mathematician’s Shiva. But non-history? It’s stacked to the ceiling: essays, history, biography, historical journals, travel, plants. I have a Texas Almanac, and use it regularly, both for information and for sheer reading pleasure. I have another one called Why Stop? It contains the text of every historical marker in the state of Texas, indexed by town and county. If you’re going be in an area, you can look it up, read the plaques ahead of time, and find new places to visit. And if you’re whizzing down the road and pass a historical marker, you can look it up in the book (or use their app) to see what you just missed. It’s really fun. I used to love looking things up in the almanac and would often continue “surfing” and browsing after I’d found what I was searching for. You have inspired me to invest in one again!